The Garmin Forerunner 230 is about as standard a running watch as you're likely to find these days. Launched alongside the Forerunner 235 and Forerunner 630, it features neither the former's built-in optical heart rate sensor, nor the latter's extreme in-depth fitness metrics. The Forerunner offers most of the tools a runner needs – distance, pace, some interval options, the ability to pair with a chest strap. What's more, because it's 2016, you get smartwatch notifications from your phone displayed, and daily activity tracking too. But at $249.99 it's a little pricey for what's essentially a fairly standard watch. The TomTom Spark sans HR and music is just $129.99 and the Polar M400 is just $137.99. Read on to find out what it's all about. Anyone who's been eyeing the Forerunner 235 will be familiar with the 230's design. The watch itself is made of a durable plastic that's super light and waterproof to 50m. It also comes with a rubber sports strap that's sweat resistant, and designed for sport. The screen itself is a low-resolution 215 x 180 pixels. It's not monochrome, as per older Forerunners, and it uses a very basic colour selection to highlight information such as HR zones (when connected to a chest strap). By default the LCD screen is very dull – so much so that reading in darkness is impossible, but there is a backlight button at the top left. It's clear the display isn't going to trouble the latest smartwatches, but it does enough. It's clear enough in daylight to read stats and messages quickly and clearly, and the knock-on for battery life is huge. The Forerunner will last around a month as a normal watch, and offers 16 hours of GPS tracking. This has come to benefit us a number of times, when we've found our TomTom Spark out of battery and then discovered the Garmin – untouched for weeks – still with enough juice for a run. Bottom line is, the Forerunner 230 is more likely to be ready when you need it, without pre-planned charging. Other buttons built into the watch include the main activity button that you use to select and start runs, a back button and up/down selector buttons for navigating menus. When it comes to stats and features, the Garmin Forerunner 230 has pretty much everything the intermediate runner needs. 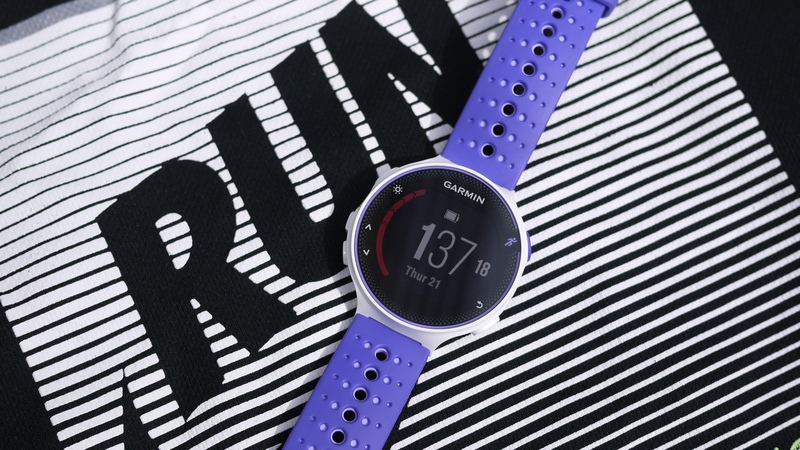 It will track distance, speed and pace via GPS with incredible accuracy, and has modes for interval sessions and custom workouts made with Garmin Connect. Garmin's GPS performance is some of the best around, and we found the Forerunner 230 locked onto satellites in lightning-quick time, which is great when you're standing in the cold in your shorts, ready to run. The Forerunner 230 isn't totally devoid of advanced stats either, as it will also look at your recovery time and spit out a VO2 max score at the end of a run, elevating it above most basic watches when it comes to raw data. But here comes 2016's big question: does the watch suffer for a lack of built-in HR monitoring? Well, this is becoming a very personal question. As we pointed out in our review of the optical-sensing Forerunner 235, the technology is not accurate for tracking high-intensity workouts. So for many, the Forerunner 230 paired with a chest strap is the best bet. But ironically, for less serious runners, the Forerunner's lack of optical HR tracking is a downside. By adding heart rate data – imperfect as it may be – your post workout review will be more detailed, you can see improvements in your fitness more clearly and you can understand your running without wearing uncomfortable accessories. We've been critical of Garmin's optical tech, but in our view, it's better to have vague HR data than none at all. Bottom line, if you're the kind of runner who wants pinpoint heart rate accuracy then the Forerunner 230 is better suited to your needs, paired with a chest strap. If that's not a concern, you'll prefer the 235's extra insights into your performances. Music playback, heart rate tech and GPS on the wrist. Does the Spark have it all? Aside from general running tracking, the Forerunner 230 has modes for biking, indoor running (GPS turned off) and "other", which essentially just opens up time, distance and speed and lets you get on with whatever crazy workout you're doing. You could hook up a HR monitor and use it in the gym, for example, for basic performance data. In terms of sports tracking, Garmin is one of the best names in the game. The Foreunner 230 operates at the more basic end of that spectrum at a fairly high price. That said, some of the more fun features that made us fall in love with the TomTom Spark are missing here. Features like being able to race yourself on previous routes, immediately dive into zoned workouts and run virtual events such as a sub 50 minute 10k, add to the running experience. Not to mention that the Spark also stores music so you can run phone free. In short, while the Forerunner 230 is as accurate as running watches get, it does little more than tell you how far you ran. As well as run tracking, the Garmin Forerunner 230 will also track your daily activity, just like the Fitbits and Jawbones of the world. Tap the down button on the homescreen to get a digest of your steps, distance walked (estimated, not GPS tracked) and calories torched. It will also show your progress towards daily goals that you can set within the app. Another feature of the Forerunner 230, which is an ever-present on Garmin fitness devices, is the Move bar. While you're sat at your desk or sofa, the move bar fills, and you'll need to move about to clear it. It's one of the least annoying move reminders out there, and a good addition for those looking to curb their sitting rituals. It's a decent set of features if you're willing to wear the Forerunner 230 all day, every day. It's a personal choice. Lots of people wear running watches casually, but we're not sold. The Garmin Forerunner 230 uses Garmin Connect, which is available for iOS and Android. It also has a web element, which is much more feature rich, which you can access via connect.garmin.com. It's one of the best proprietary platforms out there, and blows Polar Flow out of the water with its breadth of features and range of stats. The web boasts tools for building custom workouts, designing and discovering routes and reviewing data. Also, it's possibly the most complete multisport ecosystem, with running and cycling placed alongside golf and general health features. The mobile app, on the other hand, is less compelling. It's geared towards reviewing workout data and daily activity stats, and the whole thing is a little confusing and hard to use. Luckily for us, Garmin allows you to spit out data to Strava, which happens to be our preferred platform. That means you can just run or cycle with your watch, sync it up when you get back and enjoy all the segments and personal records for your routes as normal. The Garmin Forerunner 230 is a solid running watch at a slightly inflated price. Both the TomTom Spark and Polar M400 match its sport focussed offering for a lot less dough – however, the 230 does boast fantastic battery life, top notifications and all-day activity tracking for those who want it. While we had zero complaints about the Forerunner 230's performance, we'd advise the following: opt for the cheaper watches we mentioned or fork out a little more for the Forerunner 235 with optical HR tracking.